The health benefits of yoga are well known, and more and more people who participate in the meditative sport are turning to paddle boards in order to make the most out of their time spent holding stretches and focusing on their breathing. 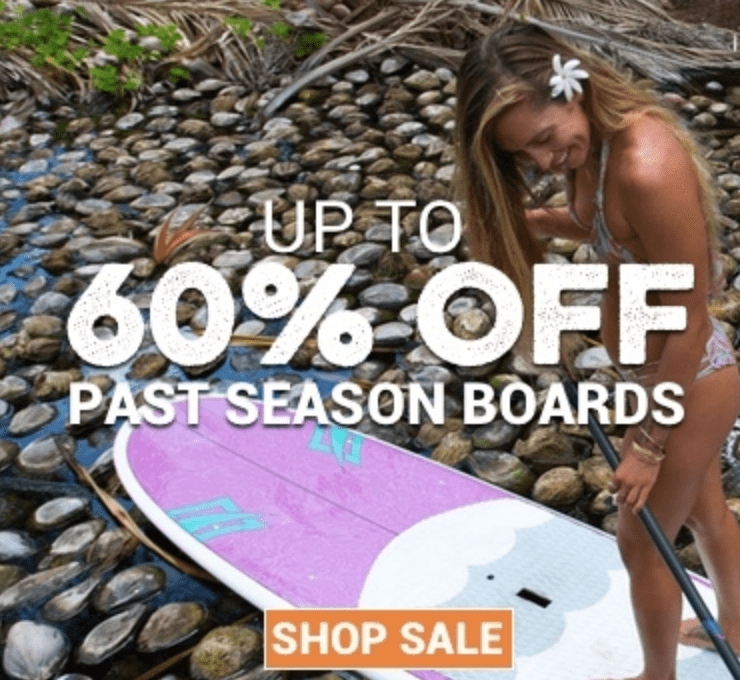 Whether you are out on a paddle board on the shores of the Kauai Coast with the lush mountains to your left in the background or you are in the middle of a lake surrounded by forest trees, you will find that a stand up paddle boards as a special element to your workout that you will learn to love. A stand up paddle board increase the difficulty of your workout since you are constantly keeping your core engaged to balance while you are on the board. Unlike a traditional floor mat, a paddle board is always in motion. If you are out on the ocean, this movement can be even more pronounced. A windy day on a lake may also create some of this effect that helps you maximize the results of your workout. In a fraction of the time that it may take in a gym on the mat, you can give your abs the workout that they have been craving when you add a stand up paddle board to your yoga routine. Adding the extra complexity of a stand up paddle board to your yoga session may also help you perfect the technique on all of the poses that you have to strike in yoga. While a floor mat may allow for a little bit of extra assistance from the floor to keep your balance, a stand up paddle board will not be quite as forgiving. While it may take some time to adjust at first, you will be surprised at how natural it feels with a little bit of time to strike your favorite pose and nail it when you are out on the water with a stand up paddle board. Taking your routine out of a crowded gym that is likely located in the heart of a busy commercial area is also a great way for you to get a little bit more relaxation out of your session. Even if you are practicing yoga in a park, it is likely that you will feel more relaxed out on the water as the waves lap silently around you and your board. The sensation of floating can help our body find its inner-balance and calm one’s nerves. Stand up paddle board yoga can help you perfect your breathing as you try to mimic the sounds that the water produces. As you and your mind focus in on your surroundings, it is natural to try and narrow your focus to a few sounds that are very pronounced. Being one with the water can become the singular focus of your session, and the relaxing effect can help you dramatically lower your heart rate. The calming effect of water cannot be overlooked for someone who is looking to make the most of their hour dedicated to yoga. Getting out on the water can give you more confidence. When you are able to master this task that most people would probably not want to take on, it is extremely empowering. When you and your paddle board are out on the water, you are totally in control of your workout. When the weather is a bit nasty, it can also be a sign of mental strength and fortitude when you are able to clear that mental hurdle and get out on the water. This form of yoga also adds a little bit of excitement to your routine. Oftentimes, we can fall into a rut when we just go to the gym or a yoga studio week in and week out to complete the same routines. The process of paddling out to your favorite spot on the lake can break your workout up just enough to keep you excited each and every time that you need to get your workout in. Stand up paddle board yoga also keeps you on your toes since you could literally fall into the drink each and every pose that you strike. 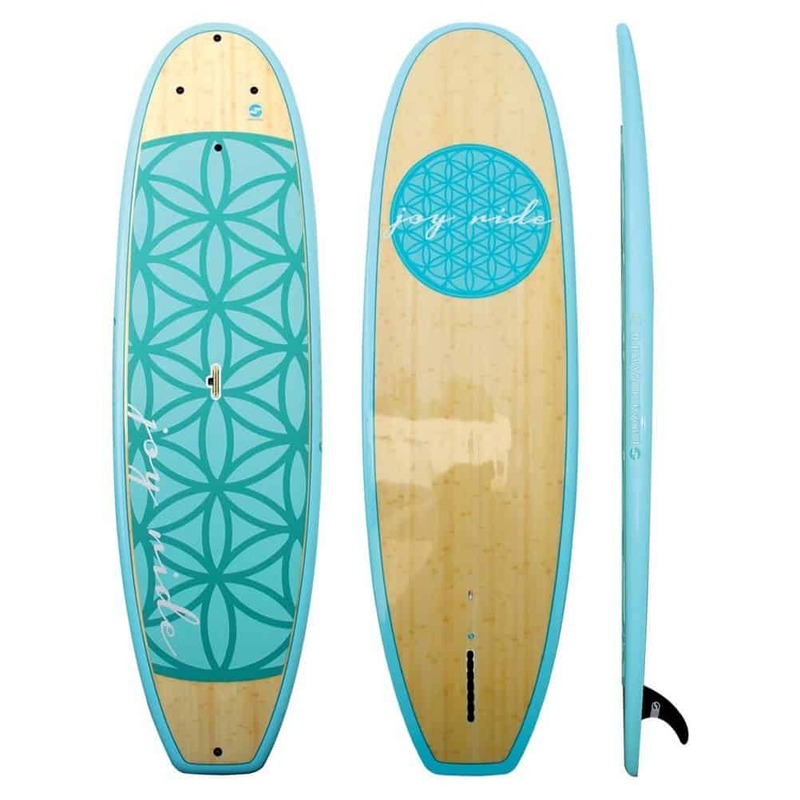 The Boardworks Joyride Flow SUP will help bring yoga and water together with with this beautiful SUP. The Flow features an impressive bamboo deck that is very durable and sturdy with appealing art that makes the board shine. The Yoga Mat style pad gives you traction as well as comfort that is made from “Non-Chaffing” Soft Croc Skin EVA which helps keep you stable when you’re moving and holding poses. This board also has multiple Deck Plugs so you can anchor down or transport gear. You will glide to the right position and yoga will seem easy with this board. 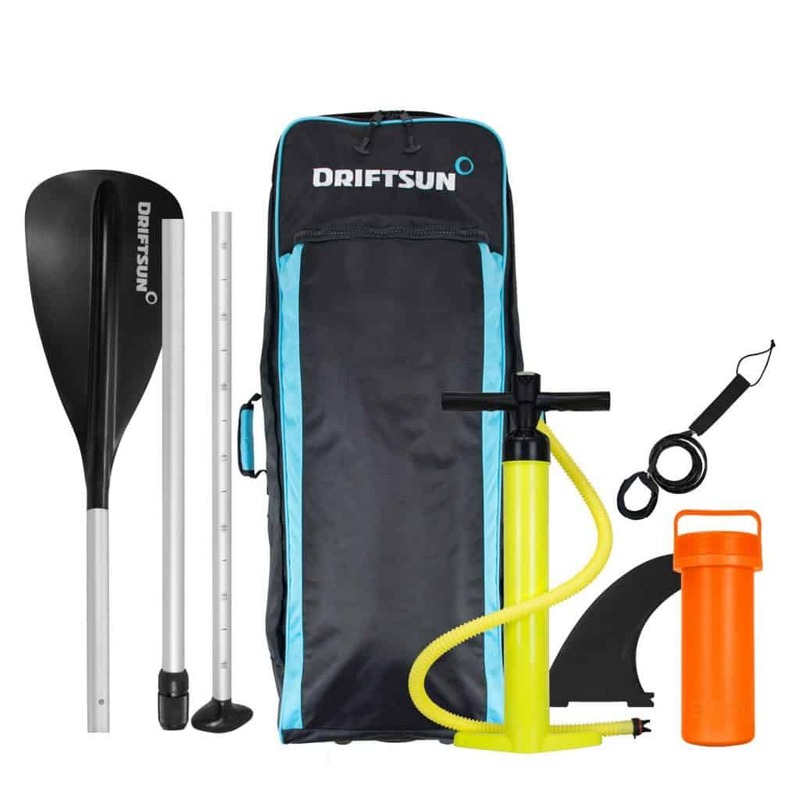 The Driftsun Balance ISUP is the ultimate water experience for people who are looking to improve their flexability and fitness while having fun on the water! This package uses only the highest quality workmanship, materials, and best accessories at an unbeatable price. This board was thoughtfully constructed, designed, and tested by a dedicated team of people who live to paddle board. 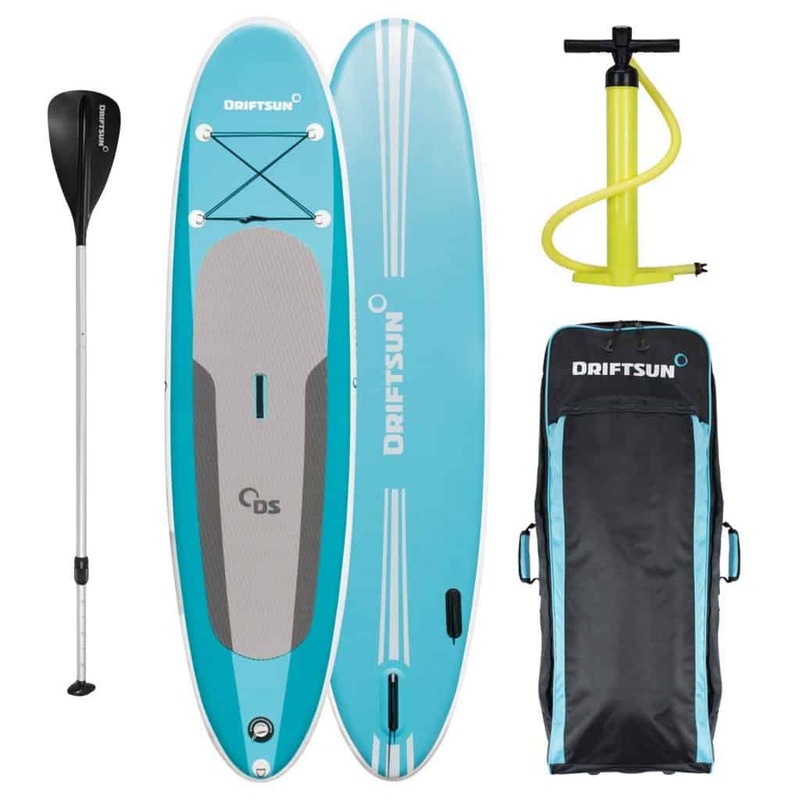 This Inflatable SUP offers superior maneuverability, stability, and some extra room to practice acrobatics and yoga on. The board has a very rigid and durable design – when it is fully inflated, it almost rivals a hard board only a lot lighter. The Balance model yoga paddle board is made from extremely durable military grade PVC and drop stitch material. Feel free to be rough with this board as it can handle almost any abuse and/or adventure. If you do happen to go into the water, stand up paddle board yoga gives you the confidence and experience that you need to get back up and try again. When you fall into the water, it can be extremely refreshing. It can also be a great teacher for those who feel like they always need to be in control of their surroundings. Since we cannot control external factors, there are times when the elements will cause the best of us to fall off the horse. On the paddle board, all you can do is smile, get back on the board, and try again.